Now that we’ve passed another Day of Judgment, we can ask ourselves what are we going to do with the life that we’ve been granted? Do we live up to our values, our ideals? Since my teens, I’ve been passionate about worldly causes, but the challenge has always been a delicate balance. The PJVoice publisher alerted me to an offer by national HIAS of a new poster for Sukkot, one that acknowledges that today, 65 million refugees and displaced people still wander the earth in search of a safe place to call home. 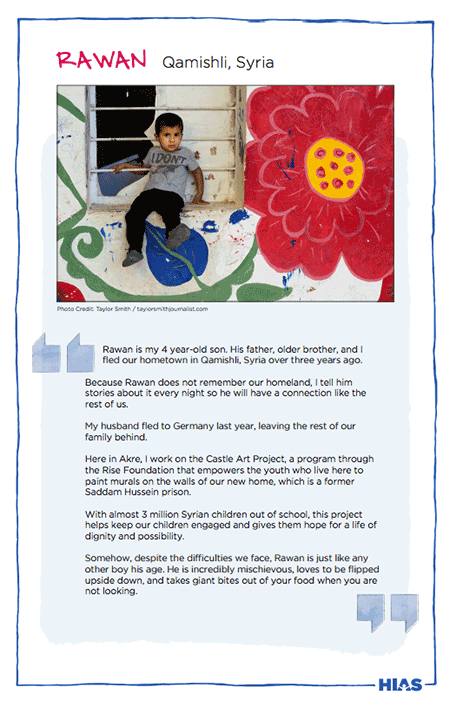 The poster features photos and narratives of five refugees, including the four-year-old Syrian boy, Rawan. I ‘ve been torn about adding secular issues to the Jewish holidays. I recall that AJWS offered their version of the Four Children to the Pesach seder: the Activist Child; the Skeptical Child, the Indifferent Child; and the Uninformed Child Who Does Not Know How to Ask. I never did use them. Liberal Jews would say that our highest goal is tikkun olam (repair the world). The goal of Torah-observant Jews, my Rabbi reminds me, is to become closer to God, HaShem. So, what is a socially-conscious Jew to do? After all, we’re taught that the Prophet Isaiah blasted the Israelites for empty piety, which is the Haftorah selection for Yom Kippur morning. I’ve encountered this kind of dilemma before: a friend who frets over using too many candles for Chanukah– her family minhag (custom) is to light a separate chanukiyah for every member of the household– or keeping lights on for Shabbat or the Chagim (holy days). I’ve long chafed at the masculine tone of our tefillot (prayers) and the absence of women in the Orthodox liturgy. How to juggle our different values? My Rabbi taught me that we don’t mix the holy with the secular, as important as social justice is. This is because passionate people can become zealots, touting their value over all other ones. Haven’t we met feminists who bash all men? Animal rights activists who destroy private property to proclaim their superior stance? May the Jewish year 5777 be one of good tidings and good deeds, in a delicate balance of the sacred (timelessness) and the contemporary. This article was written for publication in the National Jewish Outreach Program’s Bereishith Newsletter. The Book of Ruth, which is read on Shavuot, narrates the beautiful story of Judaism’s most famous convert. For me, Shavuot seems a most opportune time to recall my own conversion. It has taken almost 32 years for me to fully merge my Jewish and Chinese heritages, and the final key to doing so was tai qi (a Chinese martial art practiced for its defense training and its health benefits). This year was the first Chinese Lunar New Year during which I did not fret over my identity, and this Rosh HaShana (5776) was the first time I used the skills learned from my tai qi teacher to pray with mindful meditation. Using tai qi, I can daven (pray) with better kavanah (spiritual awareness) than ever before. My Rabbi was stunned by the connection. Born in Hong Kong, I came to the United States with my family in March 1967, after President Johnson expanded the immigration law. I entered school with a rudimentary knowledge of English. My mother, in the presence of a translator, asked for more challenging academic work when she spied my third-grade class playing checkers. Her intervention resulted in my being transferred to a class where I had to write weekly reports on current events. I graduated from P.S. 1 as one of two students admitted to Hunter High School, where my classmate was current Supreme Court Justice Elena Kagan. From Hunter, I proceeded to Brown University, where I met my future husband, and later studied Epidemiology at Columbia and N.Y.U. My Jewish journey began in the Chinatown library, where my brother and I developed a fascination with Bible stories for children. The Buddhist faith of our parents did not engage us, perhaps because there weren’t any religious texts for children. Our fascination led us on unexpected paths. My brother has since become an evangelical Christian, I am an Orthodox Jew, while our sister remains agnostic. Our parents were not perturbed by my brother’s choice, because Asians are tolerant of other faiths (not “my way or the highway”). The Torah’s fences, however, did cause more difficulty for them, but we work together to overcome those small hurdles. Early on in my path toward Judaism, my Scottish-Irish college roommate asked how I could take such a monumental step as changing my religion. I told her that it was like mountain climbing: you don’t look down, you focus on the summit. With G-d’s help, I made it to that summit. And, while it has not always been easy over the years, on the whole, I am still tickled by how the frum (religious) community has accepted me. What I did find challenging, however, was maintaining my Chinese heritage. My daughters learned Hebrew in day school, but I was concerned how they could stay connected to the Chinese community? Shopping frequently in Chinatown was my way to hear and speak Cantonese. I cook Chinese food for Shabbat dinner, I fry falafel in my wok, and our sukkah sports Chinese lanterns. But there was still a missing piece that I felt most intensely on the Chinese Lunar New Year. The constant struggle to balance my Chinese heritage and the Jewish life I have taken upon myself suddenly became more achievable when I started studying tai qi last spring It has taught me how to still my mind and focus on the qi gong movements. I now think of it as a moving meditation. Learning tai qi has had a surprising and unexpected benefit. I finally was able to bring my two identities together. Last Rosh Hashana, when I found myself sitting more mindfully in shul, I realized then that I had finally merged my two selves. I am a Chinese American Jew, energized by the wisdom of both of my heritages. 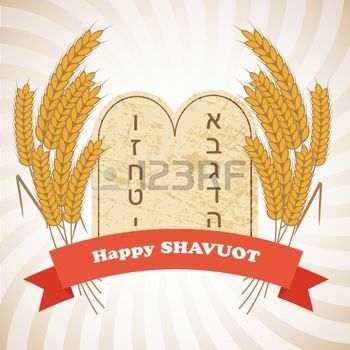 On Shavuot, I celebrate the fact that my Jewish Chinese neshama (soul) was on Sinai along with all Jewish souls, past, present and future.